Over the last few years, my interest in classic lightweight racing bicycles has increased, as much as I enjoy riding my S-Works Tarmac E5, Specialized’s original semi-revolutionary Tarmac model. This is partially because buying a new full-carbon bike (besides being insanely expensive for the newest Tarmac SL4) would not be any advantage over my current 2005 model but also because I have discovered that I enjoying riding steel bicycles that are much better than I bought when I started riding in 1972 and could not afford a lightweight bike with high-end components. Not that they would have been that easy to find in Oakville, Ontario forty years ago. I like the interesting colours of old bicycles, unlike today’s boring carbon black/white/occasional red schemes. I like the stories about the people who started workshops, who brazed the frames, who raced them in iconic events. I also enjoy hanging out with other like-minded people and admiring their bikes and riding with them. The Klassikerausfahrtgruppe in Düsseldorf’s monthly rides have been great fun, although slow and disorganized, and they always feature coffee and cake and good talk. Several years ago I read about l’Eroica, an old bike event in Chianti in Italy that took riders over the old gravel roads of Tuscany and I was determined to join in the fun. I was unable to go last year although I had registered for personal reasons, including a move so recent my bikes had not yet arrived, but I was determined not to miss out this year. With registrations limited to 3000 and of those only 500 for foreigners below age 60, I made sure to sign up early and had all my travel plans for late September (registration, flight, car rental, hotel) finalized by March. But no matter how carefully you plan things can go awry. My riding buddy Nick changed jobs and was unable to come but found a suitable replacement in Bernd, who, like Nick, lives close to Bonn. 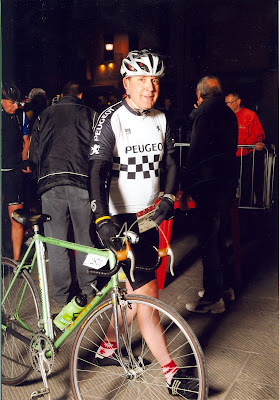 The other problem was that the bike I planned to bring, a c. 1987 Chesini, was not suitable for l’Eroica under the rules. The rules require a pre-1987 frame (I really would have been fine there), shifters on the downtube, pedals with cages and straps and non-aero brake levers, meaning the brake cables are not routed along the handlebars but are arced in a loop from the tops of the levers. This is from the translation of the Italian, which is not totally clear, but rather than go to the effort of changing the brake levers on the Chesini, I simply switched to my stand-by l’Eroica bicycle, a 1981 Peugeot PXN-10. Up until this month, I had only ridden the bicycle once, to Ricci-Sports just after I bought it in February to make sure it was mechanically-sound. I checked it over last week and made sure that I could remove the stem and the seatpost for transport and then changed the tires from the original 20 mm ones to nice new 28 mm Continental 4Seasons Grand Prix tires. The biggest challenges was getting off the old rear tire which had gotten so stiff after thirty years that I was thinking more kitchen knife than tire levers to get it off. After a titanic struggle, victory was mine and a quick ride down the street showed everything was working fine, so I packed the Peugeot in my bike case and waited for the Big Day. Thursday, September 29: Bernd arrives in the evening with his bike and, happily, his company car, a BMW wagon. This means we don’t need two taxis the next morning for our early flight but can pack everything in his car and leave the car at the airport in long-term parking. Bernd’s Gios is really nice but he will need to change the brake levers as well. We pack his back in my bike bag, with the wheel in pockets in either side packed in padded bags. This is the first time the bag has been used. It was meant for carry a bike on the train or in a car but we will risk flying with it and see what happens. Unlike my hardshell case, the bike is not terribly well-protected but we pad the frame with foam pipe insulation and hope for the best. Friday, September 30: We are up at 4:00 am and are soon out on the road with all our baggage. The streets are empty and we get to the airport quickly. It takes a while to figure out where the long-term parking is but we find a good spot near the elevator and drag all our gear to the SkyTrain to take us to the check-in. It’s all a bit awkward, as usual, but we get checked in quickly. There is a moment of panic when the clerk says that our reservation is only for one bike, but luckily I have all the paperwork organized and she sees that we have paid for two bikes. Time for a coffee and a croissant. There are already a lot of people at the airport and after a short wait to get through security we are in the departure area and our flight leaves punctually at 6:30 for Milan and we were there just after 8:00. The baggage arrives fairly quickly in Milan and once we find our bike cases we make our way through the terminal (not designed for people with bike cases since we cannot get through any sliding doors without unloading our baggage cart first) and quickly find the Europcar rental counter. I had booked a Alfa Romeo 159 station wagon class car and we were delighted to be given the keys to a very nice diesel Passat wagon. This was similar to our office car, which is a sedan, but had a standard transmission. I let Bernd drive as I am not that enthusiastic about shifting gears not on a bike and I set up the TomTom to navigate us to Chianti. Most of the four hour drive from Milan was really boring. The autostrada was quite busy, although we did not run into any traffic jams near Milan, and there are an amazing number of toll stops along the way. The road passes over a flat plain and the light was very strange as it filtered through a kind of damp fog. There were signs all over the highway about fog so this is pretty common. It is quite nasty and I was glad when we approached the hills of Tuscany. Bernd had to make a business call so we stopped for a break at a highway restaurant. It was very busy but getting drinks was the work of a moment. Unlike German highway stops, you don’t have to pay to use the washroom (although there are those road tolls). I found the store quite interesting as it had a lot of local food products, including Parma hams, Parmesan cheese and Chianti wines. Back on the road just outside of Florence we ran into a traffic jam, the kind where the traffic comes to a complete stop. Everyone turned off their engines and stood around in the sunshine and after 45 minutes we were able to get going again. There was no indication whatsoever as to what had caused the interruption: no police cars, damaged vehicles or construction. Maybe it was an accident that had happened hours earlier. In any event, we soon left the autostrada and were driving along a wonderful road to Castellina in Chianti, where we would be staying for the next three nights. We easily found our little hotel, which is in an ancient stone building. 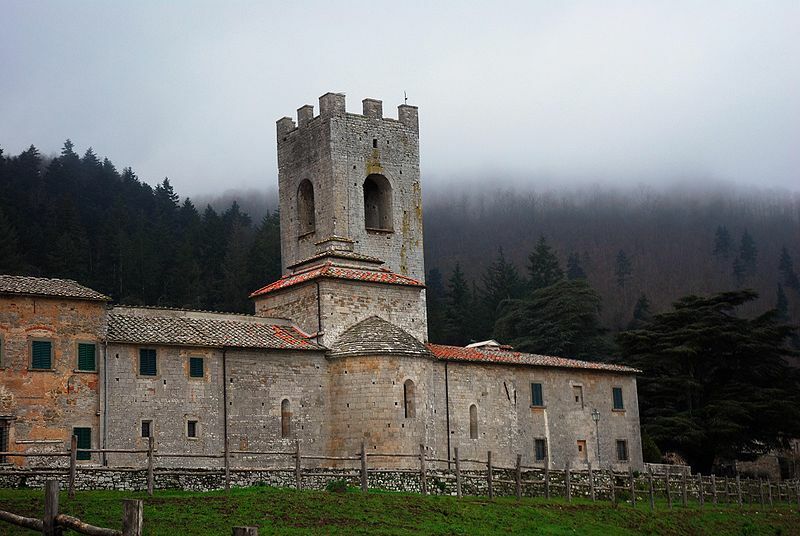 It has a beautiful swimming pool and is surrounded by the cypress trees found so typically in Tuscany. From the street there is a view towards Castellina proper (a 5 minute walk) and its impressive castle, known as the Rocca. We unpacked our gear and reassembled the bikes in the courtyard before going for a walk into town. Castellina was originally an Etruscan town (there is a 6th Century BC mound grave not far from our hotel), then after the Roman era became an important garrison town for Florence. It was the seat of the Chianti League, which included the nearby towns of Radda and Gaoile, but due to raids and pillaging the Florentines built a wall around it, along with the Rocca, in the 14th Century. It retains some of the architectural style of the 14th Century and it was a delight to amble down the main pedestrian-only street and look at the little shops and restaurants. We went to the tourist information and picked up a nice map of the Chianti region that shows all the wineries but would also serve as a good map for cycling. I bought some postcards and then we had lunch in front of a little café. Tortellini con funghi for 5 Euros, and it was very enjoyable although it came in a plastic dish. On the way back to the hotel we looked at the Via delle Volte, an underground tunnel with windows on one side allowing you to look into the Chianti countryside and shops and restaurants on the other side. It is a flourishing place for tourists, but the town’s population of 2800 today is only half of what it was in the 1930s. Time to test the bikes! We rode out of the hotel and decided to head towards Radda in Chianti, 13 kms away. There was a bit of fumbling with the bikes and we were off, with a nice descent after the first turn. It was here that I discovered that Weinmann brakes on old Peugeots are singularly ineffective. The brake blocks made a lot of noise but it took a great deal of strength to slow down. However, the road was in excellent condition and there was no traffic to speak of, so with care I could maintain some good speed. We proceeded to enjoy the late afternoon sun and the wonderful roads with their gentle curves. Road engineering in Chianti is very good: the grades are reasonable and potholes a rarity. I was getting used to the handling and shifting of the Peugeot (both very nice) when I suddenly felt that sinking feeling that indicates a puncture is taking place. Pulling off the road, I found a very small hole in the tube and no glass shards or metal bits that would have cause it. Bernd’s suspicion was that the 1981-era rim tape had dried out enough to cause the tube to rub against bare metal. We found an empty wrapper on the side of the road and used it as a boot where the rim tape was insufficient and replaced the tube. The frame pump of the Peugeot worked nicely and within a few minutes we were back on the road to Radda. While we were doing the tire repaid, a group of three cyclists, all on old bicycles, went by. They were not all that fast, so we quickly caught up and joined them for a while. 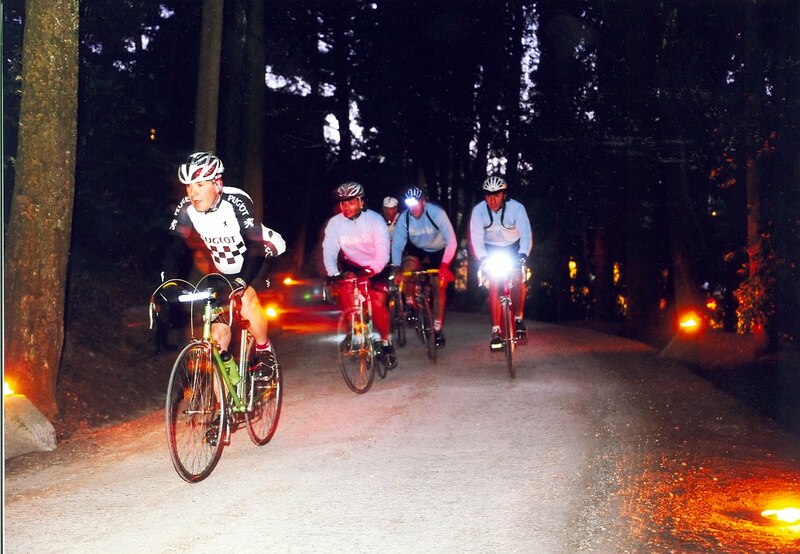 On the descent into Radda everyone’s aged rubber brake blocks screamed in that typical old bike fashion. We stopped to look at Radda and take a few photos but as the sun was looking like it would set soon, we reversed course and rode back into Castellina. I was a bit surprised that our little ride of 23 kms had included 400 m of climbing but I was mentally prepared for a lot of uphill riding in Tuscany. The Peugeot was a delight to ride, light and responsive. The Simplex Super LJ derailleurs shift very smoothly and very fast, although I overshifted twice and dropped the chain so that needs to be adjusted. The Maillard freewheel on the bicycle has huge cogs, ideal for climbing, so the French knew what would work in a place like Tuscany. The Weinmann brakes, on the other hand, will be replaced sooner rather than later with a set of Mafac Competitions that might actually slow the bike down. The only issue with the bike (besides the brakes and the rim tape) is that the cages for the pedals seem too short and I cannot get the cleats on the shoes to stay in one spot on the pedals. It is hard to find big cages for big feet since only small people seemed to ride racing bikes in the Good Old Days. After a quick shower and change, it was time for dinner. It was another pleasant walk and we looked at various restaurants. One next to the Rocca looked very good but there was a children’s birthday party going on or just ending and the noise was deafening so we beat a retreat to the lower level of town where we found a restaurant that did an antipasto buffet. It looked good so we enjoyed a lightish meal with lots of olives and mushrooms, marinated vegetables and bruschetta. And on the the way back to the hotel we discovered what might be the best ice cream place in Italy. Saturday, October 1: Getting up early, we took the bikes into Castellina for a coffee and a pastry before starting our planned morning ride. Properly fortified with excellent Italian espresso, we rode into the cool air, heading west along the Via Val d’Elsa/SR 429. We had a fantastic vista to the left as we rode, looking deep down into the valley, riding past vineyards. The morning sun had a marvellous golden quality to it and the enveloping cool fresh air, scented by the pine forests on our right, sharpened our senses. There was no traffic and the road, perfectly surfaced and whose curves kept presenting us with new vistas, took us on a glorious gentle descent all the way to Poggibonsi, 20 kms in all. As short as it was, this has to rank as one of the most beautiful bicycle rides I have ever experienced. Of course, all things come to an end. Poggibonsi is not very nice, a busy town that supplies those things that picturesque villages like Castellina do not. The traffic was heavy, the roads not as well-maintained and our route took us over the Siena-Florence highway and through an industrial zone. But soon we were riding again in the countryside, leaving the SR 429 and joining another road, SP 63 that took us south and west. This road required us to climb as we left Poggibonsi and we were passed by a fair amount of traffic, including numerous tour buses. Concentrating on our climbing, we were occasionally treated to a glimpse of our goal, and that of the bus tourists: San Gimignano. A steady 7 km uphill brought us finally to this remarkable town, a UNESCO World Heritage Site. It has been nicknamed “the Manhattan of the Renaissance” due to its remarkable towers. First founded by the Etruscans, the town, located on a major trade route, had become a city-state by the 12th Century. The wealthy merchant families demonstrated their wealth and power (and competitiveness) through the erection of towers and by 1300 around 72 of them had been constructed. But the advent of the Black Death in 1348 reduced San Gimignano’s importance and it became a possession of Florence. Over the intervening years, many of the towers collapsed or were simply torn down (as was the case with the towers in other Tuscan towns) but today 14 of them still exist. Walking through the old town is a remarkable experience, even when walking with cleats on cobblestones and pushing a bike. It was cool and shadowy and eventually we reached the central part of the town, which features no fewer than four impressive squares. Some mountain bikers we had passed on the way up came to the square and asked us whether we would be doing l’Eroica. When Bernd said that we were doing the 132 km route, the man said it was very difficult. Ah, good to hear! Well, I guess to be considered a Hero of the Road, you need to suffer a bit. Some cold water consumed, a few postcards bought and some photos taken, we soon headed back out through the city wall and onto the road again. We had seen a crossroads on our way up that looked promising and took this climbing road towards Bibbiano. We had an excellent view of San Gimignano from across the valley and after stopping to take a photo I had that sinking sensation again: flat tire No. 2! Another tiny hole meant another quick repair but it was clear I would have to replace the rim tape. We were now on the return leg to Castellina anyway so we just took it easy on the way back. At Colle di Val d’Elsa we got a bit confused in our directions and Bernd, who speaks Spanish but not Italian, asked an elderly gentlemen for assistance. His directions were very complex, delivered in a thick Tuscan accent making comprehension that much harder, but we thanked him and kept going. We were on the road we wanted it turned out, although there was more traffic than we would have liked. Heading east, we crossed the autostrada again and came to Staggia, where we turned right and soon saw a sign for Castellina. Near the crossroads was the Bartali winery, founded in 1927, which I had to photograph in memory of the great Tuscan cycling pro, Gino Bartali. And ahead of us the road went up and up and up and up: 10 kms of fairly steep climbing was our lot, making up for that 20 km of gentle descent first thing in the morning. It was a hard ride in the hot sun but there was lots to look at on the way up and soon we were back at the hotel after completing 66 km of cycling, with 1100 m of climbing. But not before stopping for more ice cream. We packed Bernd’s bike in the car and took my back wheel (I removed the tire) as well since we were now going to spend the afternoon in Gaoile and were certain to find a bike mechanic there. Gaiole is the epicentre of l’Eroica, which began in 1997 with 92 participants and has blossomed into a major cycling/tourism event that sees Gaoile, with its 2700 inhabitants, completely overrun by crazy bicycle people, Italian and foreign, for several days at the end of September. After passing through Radda we had a nice descent into Gaoile, about 22 kms from Castellina, and saw signs for parking. The place was already very crowded but we got a good spot not far from the flea market and also close enough to a marquee under which four mechanics were working. Bernd explained that he wanted his brake levers changed and the mechanic found a set of inexpensive ones and agreed to change the levers, the brake cables and the bar tape. For my wheel some new rim tape would be found. With that settled, we then went to look more closely at Vintagebikeville. The main street of Gaoile was filled with cyclists and bicycles. People were eating and drinking in the few restaurants and cafés to be found in town, while others were fixing bikes or just looking at bikes. There were at least a dozen Colnago Super/Mexico bikes in Saronni Red like the one I own, lots of Gioses (Gioii? ), hundred of celeste-green Bianchis, and many bikes whose makers were unknown to me. I met up with some of the Klassikerausfahrtgruppe who were proudly riding their German bikes (Rickerts) and I heard languages and accents from all over. In addition to the Italians, the largest contingent was German, followed by UK riders (usually recognizable by the big saddlebags they like, as well as their odd bicycle brands) and there were plenty of Americans too. There were many interesting jerseys being worn as well and I could see that I would be making up a part of the big Peugeot presence with my black-and-white checkered jersey. After familiarizing ourselves with the town, we then walked back towards the car to see what we might find of interest in the flea market. This was quite substantial although prices were not particularly low. I found some nice tricolori tabs for the pedal straps on the Chesini, a new Peugeot cap to match my jersey and some triocolori socks. There were many bikes for sale and some were quite reasonably priced if you could figure out how to take one back. There was a vendor from Munich selling NOS (New Old Stock) bikes from a store that had gone bankrupt and I was tempted by a nice Campagnolo-equipped Torpado for 550 Euros. But Torpado is a brand that thrills no collector and I also reminded myself that I had sworn to ride my bikes instead of just accumulating more. Bernd was quite eager for me to add to the flock but in the end I was happy I had not brought enough cash with me in any event! On our way into the building that serves as headquarters and registration central for l’Eroica, we passed a gentleman in period clothing with a Bianchi. He was happily posing for photos so I took the opportunity. There are many people who ride l’Eroica in knickerbockers and wool jerseys, with flat caps, goggles and tubular tires around their shoulders and a number of them were walking around today. The look is terrific but I for one would not think of riding steep gravel roads without a helmet. And with 30C temperatures and no shade, I am not so sure how well wool works. There was a section where foreigners could pick up their registrations and I was impressed with how quickly everything went. I was given a nice old-style musette (the food bag racers still use) with great big buttons on the side, along with a cloth bag with two zippers and pockets for a wallet and road book. It had my jersey number, my bike frame number (to be attached with the included bits of string–no plastic zipties for l’Eroica! ), a cycling cap, a magazine about the history of l’Eroica, some brochures about other rides and the all-important carnet, or road book, which not only indicated which roads we would ride but also had places for the control stamps en route. Le Coq Sportif, a French cycling clothing brand that is seeing a rebirth and is a l’Eroica sponsor, had a stand in the building and I bought my l’Eroica wool jersey, with two maroon strips and “l’Eroica” printed in script on a cream background. There were photos of Tuscan cycling history to look at but it was pretty crowded so we went outside to look at more bicycles and things to buy. Bernd spent some time with the Gios people, showing off his bike and buying Gios memorabilia, and I took photos of some really interesting bikes. Although I had a soft spot for a beautiful restored Bianchi (with the weird Campagnolo Paris-Roubaix shifting system that requires you to have several hands plus eyes in the back of your head to shift), my favourite bike was a restored 1937 Gagliardi, a red bicycle with yellow lugs and another peculiar pre-War shifting system (an Osgear, perhaps?). There was an interesting Dürkopp from Germany, with a top-tube mounted Fichtel-Sachs gear lever, an excellent early Automoto and, seemingly the only one ever outside of a collection of vintage posters, a Royal Fabric. Of course, you see some particularly novel things in flea markets. I was very impressed by the fellow who came with a beat-up old bike with the handlebars wrapped in rope. And sitting on the rope quite placidly was a full-grown owl. This got quite a bit of attention, and someone even stroked the owl's head without it reacting in a bird-of-prey way. Sunday, October 2: We got up at 4:30 and drove the car, bikes and stuff for the day in the back, back to Gaoile for the start of l’Eroica. It was pitch dark but already the village was active as those starting the long routes (205 and 132 km) were getting ready to leave. We were directed to a parking place next to a warehouse and quickly got the bikes set up and headed to the start line. Everyone leaving this early was supposed to have lights. Bernd had a good strong light mounted to his helmet and I had a LED light on the handlebars, as well as a highly-visible taillight under the seat. I was wearing armwarmers and long-fingered glove liners because it was quite cold but I knew in a short while we would be sweating. We pulled up to the control stand and had our cards stamped and at 6:10 we officially departed for the 132 km course of l’Eroica with some trepidation. We skirted around Siena (a bit disappointing as I hoped to see something of the famous town) and a few more climbs and descents brought us to Radi at Km 48 and 9:40. It was a bit startling to take 3 ½ hours to go 48 kms without having walked but the road conditions had not been ideal. The food stop at Radi was great. There was salami and Chianti, as promised, but also things more suitable for a long ride including some of the excellent local cake, tortona. The Peugeot’s frame only allows for a single water bottle so I took care to stay hydrated and fill up wherever possible. There was warm tea here which hit the spot and soon we were off again. Bernd, who had been considering riding the 75 km route since he was worried that he did not have another tubular in case of a flat, was very cheerful now as he had managed to buy two tubulars for 30 Euros from a mechanic at the food stop. There was a very serious climb at Murlo, around 55 km into the ride, and I surprised myself a bit by being able to gently ride all the way up through the very steep gravel incline, working my way around people who were having to walk. Many of the old bicycles had gearing suitable for racing on paved roads and while this may have worked for young racers (and I saw plenty of younger riders able to cope), it was hard going for a lot of the senior members of the group. Going down the other side was quite terrifying as well as it was very steep and the gravel unstable but eventually we reached a flatter section of gravel road. The roads are fairly wide but not well-maintained and there are stretches of washboard surface. I tried to ride a smoother path in the middle but the roads were open to cars, which came by all too frequently, raising dust clouds and forcing me onto the washboard sections, which were really terrible. L’Eroica wants to be compared to the Tour of Flanders but having ridden in Flanders I would have to say the Strada Bianca, the White Roads of Tuscany, are much worse. Washboard is much harder than cobblestones as you are constantly slamming into another gravel ridge. At least the people at Peugeot in Romilly-sur-Seine knew how to put a strong bike together since nothing fell off in spite of all the jarring. Leaving Asciano we immediately began another climb on gravel but this time it was so steep that I had to walk from about halfway up. Reaching the top I was stunned to see a whole series of similar climbs ahead. The next stretch was the most difficult of the entire day as it was very hot and we had a surprising amount of traffic go by (although at this point any single car was too much traffic!). It was very uncomfortable to walk in the cleated shoes and pretty scary to ride downhill each time over the top. Progress was very slow and the Peugeot and I were covered with a layer of white dust by the time we reached the next paved road at Torre e Castello after 11 kms of Gravel Hell. There was a fountain in the village but someone also had a hose running so cyclists could fill up on water. I really needed this. No sign of Bernd anywhere but I thought I would find him at the next food stop. The next stretch of road was very good, a fast descent followed by a climb that brought us to Castelnuevo Berardenga at Km 101.5. It had taken me 2 hours and 7 minutes to ride/walk/ride/walk 17 kms, probably my slowest time ever on a bike. The signs directed me right into the heart of the town and it was a pleasure to ride through the cool dark streets. The main square was packed with hundreds of cyclists, many of them relaxing on comfortable chairs. I had my card stamped by a trio of officials who were clearly celebrating the centenary of Italian unification as they wore wonderful fantasy uniforms and, in one case at least, fake moustaches. I was surprised not to see Bernd so after 15-20 minutes I left him a phone message then got back on the bike for the last stretch. It started off very well and I made good time until I reached my seventh stretch of Strada Bianca at Km 118. At this point I was very tired and my left leg was hurting from walking in loose gravel and sliding with the cleats so I resigned myself to doing a bit more walking. I was now going back on the route we had ridden first thing in the morning and had a chance to see the castle of Brolio in the distance. Riding/walking/riding brought me to a steep climb next to it and then one finally scary gravel descent at Km 121 and I was on excellent pavement. It was mainly downhill but the last 11 km felt endless. But soon I was on the outskirts of Gaiole and riding across the finish line, receiving a specially-labelling bottle of Chianti and a Siennese speciality cookie. Bernd was there waiting for me to come in. It turned out he had completely missed the last food stop and had had to struggle to Gaoile with minimal water. We walked together back through the town for one last time and put our bikes in the Passat and headed back to Castellina, proud of our efforts. After getting cleaned up, we walked (unsteadily) back to the pedestrian street and enjoyed a fine dinner of green salad followed by pasta with porcini mushrooms with a glass of Chianti. Of course, on the way back to the hotel we had to stop for ice cream. Actually, we each had two servings of ice cream this time! I was ready to sleep by 9:30 but Bernd was worried he would wake up in the middle of the night as we had had so many early days on this trip. This was not to be an issue as we were both sound asleep within minutes. Our day's effort had been 133 kms with 2188 m of climbing. Or walking. Monday, October 3: Our plan this morning was to get back on the bikes for a recovery ride to Radda, where we would have breakfast. After riding the descent out of Castellina, Bernd said his legs were really dead so we decided to just go back to the hotel and pack up the bikes after finding breakfast. Next to the swimming pool was a hose so we were able to wash the dust off the bikes and our shoes. I decided to go for a swim but although the pool was really beautiful, it was unheated and still in shadows at this time of day so a few lengths was all I needed. My leg was quite sore and the swimming helped. Our timing was actually quite good as our hotel was serving breakfast and I had more totally delicious Italian coffee along with some croissants, followed by a bout of postcard writing. The Post Office was right next to the hotel so I was able to get some nice Italian stamps and send everything off. Bags packed, we said our goodbyes to our pleasant hosts and drove out of Castellina to the north. We had discussed how we might go back to Milan with most of the day ahead of us and decided to make a stop in Lucca and look around there. It took about two hours to do the drive and we parked out the outskirts of the city in a big lot and walked through the gate in the impressive city wall. Lucca is a gorgeous city but there are so many cyclists you have to be careful not to be run over by people doing their shopping. There are no cars in the central part of the city, which is wonderful, and it was fun to look at the many stylish little shops. We had some panini and coffee in the main square and enjoyed looking around. There were banners advertising the reopening of the museum in Puccini’s birthplace and lots of people walking around. Returning to the car, we continued to drive northwards, passing the great marble quarries at Carrara and turning off to visit Lerici, a small city on the Mediterranean that Bernd had visited on a bike trip in 1985. It is in Liguria, on the edge of the famous Cinque Terre, and was very picturesque, overlooked by a fortress. There was a yacht harbour and several beaches, pretty brightly-painted houses and lots of ice cream places, one of which received our patronage. It was quite hot and it was sad to leave the beaches and palm trees and take the autostrada back to the Malpensa airport north of Milan. It was also expensive, probably costing 45 Euros in tolls! We got to the airport but could not find a gas station, so I restarted the TomTom and it directed us a few kilometers away to where we could fill up. Driving the big station wagon nearly 900 kms, we had averaged 5.2 l/100 km, bringing the total cost for diesel fuel to exactly 80 Euros. Bernd has a company car but thought that if he were to buy his own, the Passat would be ideal. We checked in without any issues and dropped off the bike cases in the Bulky Luggage area. Bernd later realized he still had his l’Eroica wine in his backpack and since we could not put it into the already-checked bags, he was able to check the backpack and thus save his hard-earned wine for consumption in Germany. Our flight was an hour late leaving Malpensa, so by the time we got to Düsseldorf, got our bags, made our way back to Bernd’s car and drove to my place it was after midnight. But we both agreed the trip had been a great success and are already considering doing l’Eroica again in 2012. For anyone considering riding it, it is a wonderful experience: stunning scenery, great people and a marvellous atmosphere. Yes, I really am willing to do it again but I plan to do it with shoes without cleats, and with much better brakes! hi Leslie, sounds like a fine time indeed! did you see my friend Lars in Italy? haven't spoken to him yet. if you read through your posts, ice cream and croissants feature heavily in many; this just a reference to your later blog about the new smallish Chesini jersey you bought ;-). re. brakes: keep the brakes, and buy US-made red KoolStop pads for them. Harris Cyclery. a good idea for any brake. re. 2nd water bottle: either a simple metal cage holder of course(i like the ones on the hbars), or if you want flexibility, the Twofish water bottle holder is good. i just bought one. hope to be on a bike in Duesseldorf soon! Hi, Alex. You know, I actually have a handlebar mount for a bottle cage and completely forgot about it! Thanks for the good idea. The Weinmann brakes flex a great deal and since I have set of Mafacs I thougt I would just change over and still be period-correct. The pro Peugeots had Mafac brakes on them and this bike is one level below those. It seems the only corner they cut was in equipping the bike with these brakes. And, agreed, KoolStops are the way to go on ALL brakes. My shoes work really well with my other pedals/cages/straps but I will switch to cleatless shoes simply because of the uphill walking involved, although I hope to do less of this next year. As to the Chesini jersey, I think it can't possibly be the beer/ice cream/pastry/bread I have enjoyed for the last year in Germany that makes it seem small. It must be the Italian sizing, I say! I am still hoping to do more riding here this season but the weather has become rather poor. When you are here we might be forced to just drink Alt-Bier. It was my 4th time doing the 205 course. With 1 Dutch friend and 2 Italian friends. But for me L’Eroica is the best thing you can do on a bike. The course, the landscape, the food, the people, the old bikes and let’s not forget THE WINE! the english chap who crashed on his mercian? that was me.. boo. hopefully it won't be so dusty this year!